A conference of Society of Mary Brothers is recommending brother candidates for the Society receive their initial formation in the Marist Community at Tutu. Further formation would take place at Marist College. This is one from a number of initiatives proposed by the conference. The conference, held at Lomary, Fiji, May 9 – 13 also recommended the Tutu formation programme be made known to other units in the Society so that brother candidates from these units can attend. Key to the success of these and wide range of conference initiatives is that a formation programme be developed specifically for the formation of brothers and that a brother be the key formator. The meeting was also particularly keen to have the brothers vocation be promoted in the Marist units of Africa, Brazil and the Philippines. A Society of Mary brother is a vow religious committed to prayer, community and apostolic life as outlined in the Constitutions of the Society. 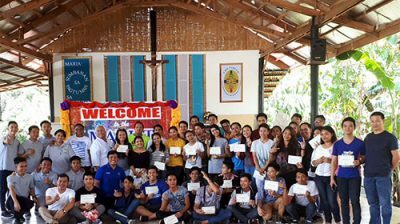 Working in parishes in collaboration with the laity in youth programs, Seminars, conferences, assisting in giving instruction and preparation for the sacraments. Teaching in Schools, Vocational centers and adult education. Being chaplains to hospital and prison, spiritual directors and counsellors. The recommendations are due to be discussed this week by a combined meeting of leaders from Asia, Australia, New Zealand and Oceania.